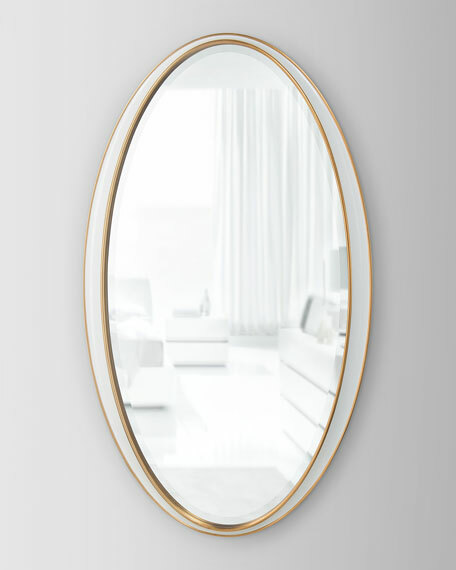 Handcrafted beveled mirror with resin frame. 49"W x 1.5"D x 28"T.
Boxed weight, approximately 26.4 lbs. The majesty of The Adela Sleigh Bed cannot be overlooked. This bed is fully upholstered in creamy velvet that sweeps from the high, curvaceous headboard, down along the rails, and around the low footboard. 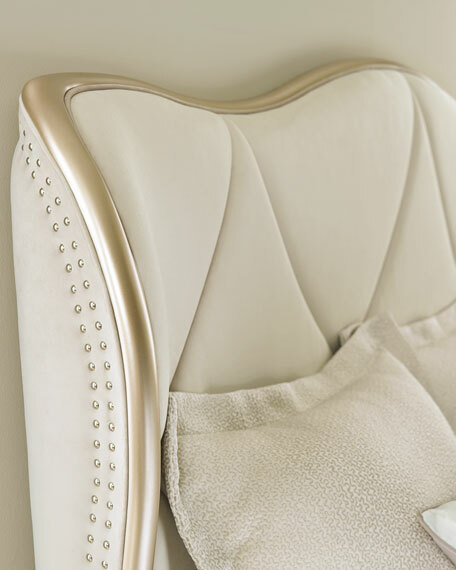 The collection's lyrical asteroid motif is on full display in the headboard's light tufting. 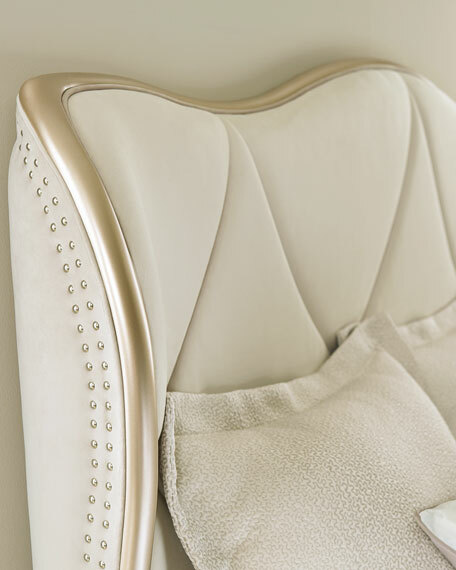 Beautiful double-nail details trim the bed's edges. The bed's frame offers a low profile as a result of slim, contemporary feet, making it a highly comfortable piece for generously proportioned bedrooms. 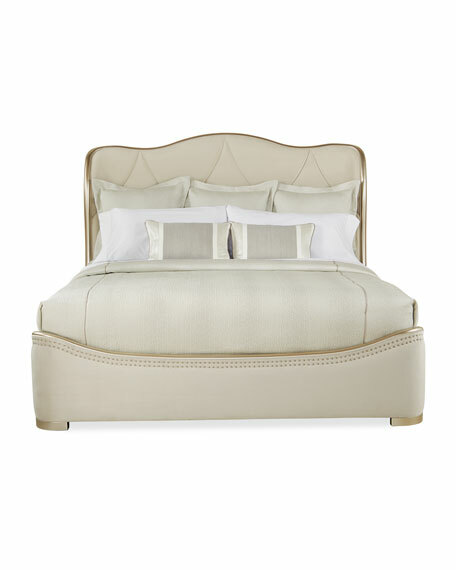 Handcrafted, fully upholstered bed with exposed wood. 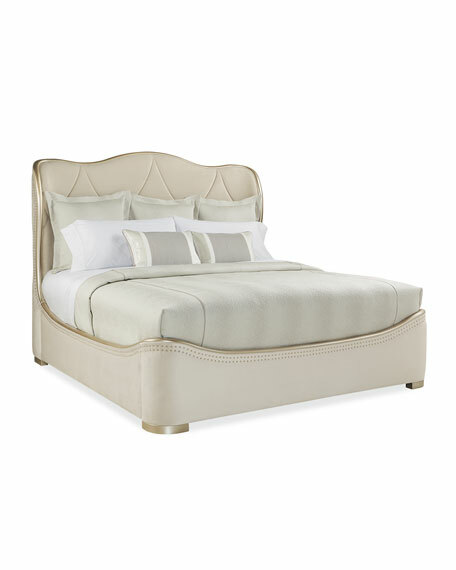 Upholstered headboard, footboard, and side rails. Double row of nails around edge of headboard, footboard and side rails. Denim fabric on back of headboard. Hardwood frame and birch solids. 82"W x 89.3"D x 64"T.
82"W x 85.3"D x 64"T.
Boxed weight, approximately 248.6 lbs. 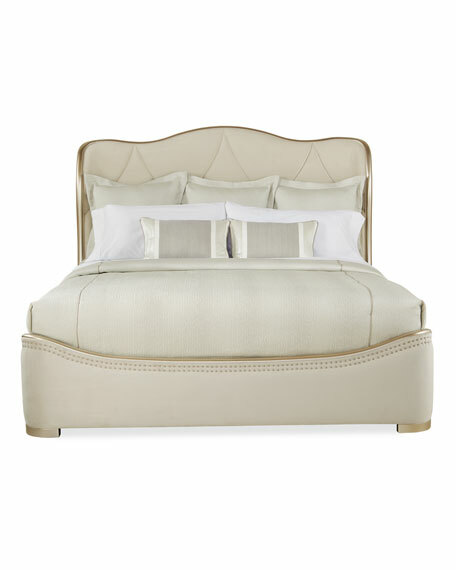 66"W x 85.3"D x 64"T.
Why select a traditional rectangular night stand when you can add an oval statement to your bedroom? 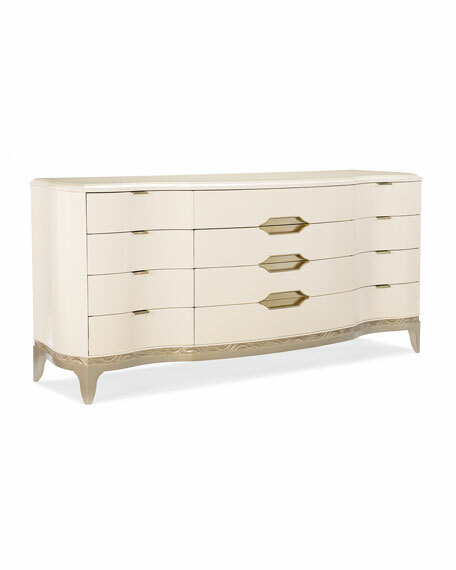 This piece, in beautiful washed alabaster maple, has three curved drawers. 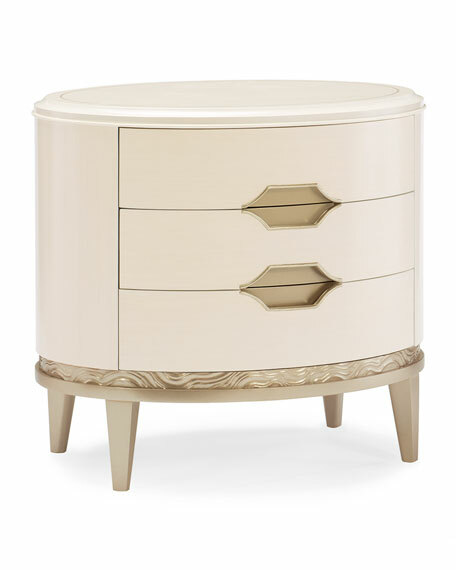 The whole piece sits on a base that is trimmed in a carved ribbon motif, finished in shimmering blush taupe, and delicate trapezoid feet. Carved base moulding and legs. 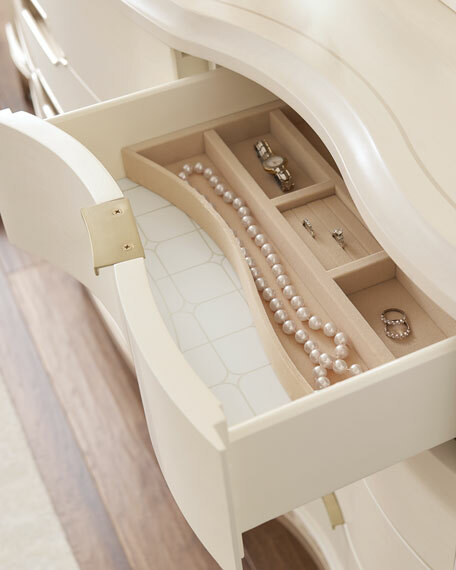 Drawers feature undermount soft close guides. Top drawer bottom has silkscreen pattern. Decorative silkscreen around perimeter of top. Finished on back side of case. Drawers function with recessed finger pulls. 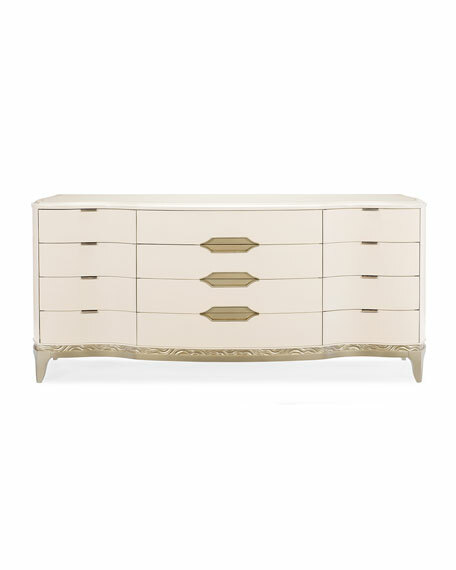 29.8"W x 22"D x 27"T.
A modern interpretation on refined neoclassic design, this generously sized dresser features dramatically curving lines on the front and sides, as well as beautifully carved trapezoid feet. 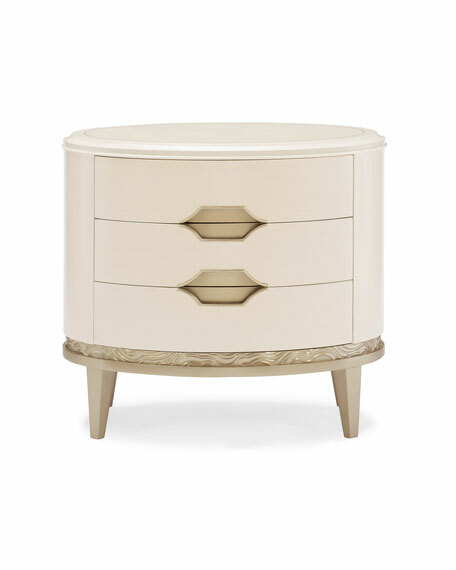 The washed alabaster maple case is offset by three inset handles in the center drawers that are carved in the shape of elongated asteroids. 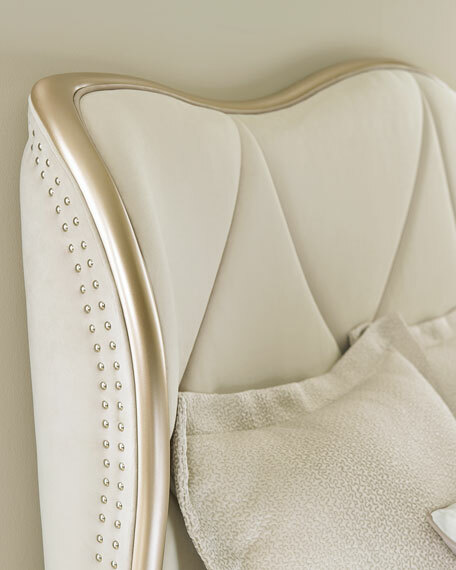 The base of the piece is trimmed with the collection's carved ribbon motif in shimmering blush taupe. 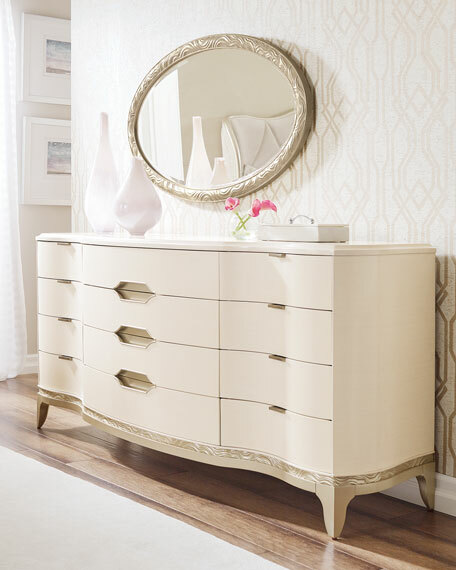 Inside each of the top drawers is a delicate stencil print that adds to its charm. 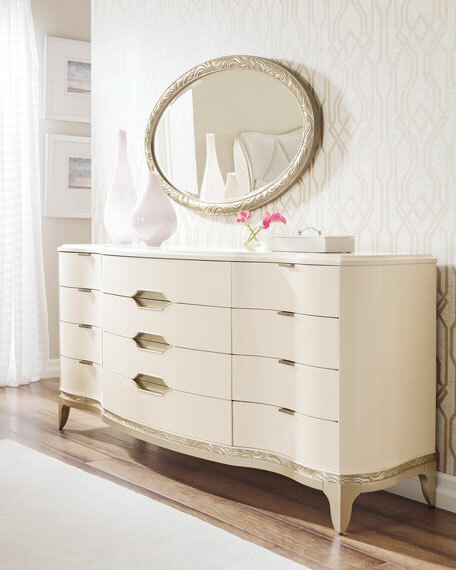 The Adela Dresser is perfect for a refined bedroom. 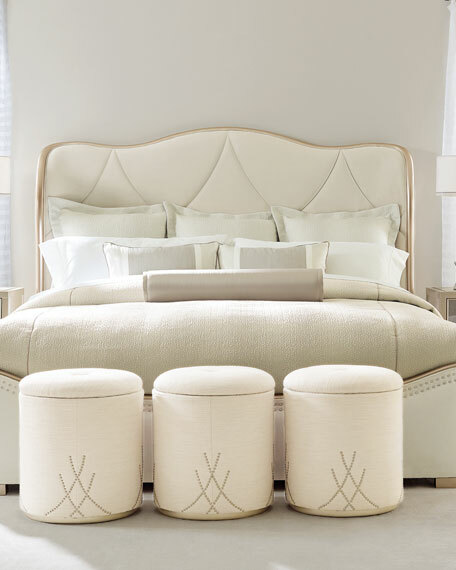 Removable jewelry tray in top right drawer. 76.8"W x 22.5"D x 35"T.
Boxed weight, approximately 360.8 lbs. 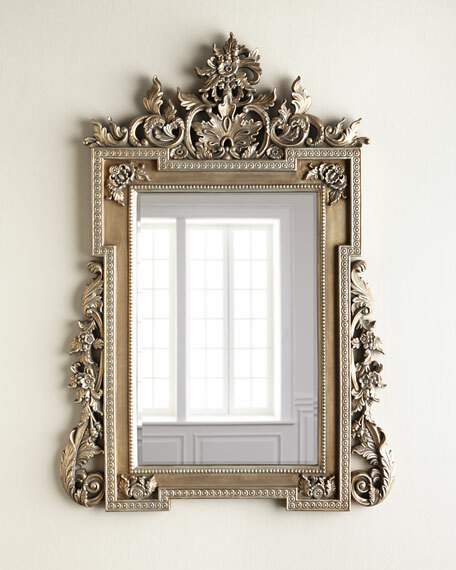 EXCLUSIVELY OURS.Handcrafted clear mirror with spots and flowers on frame. 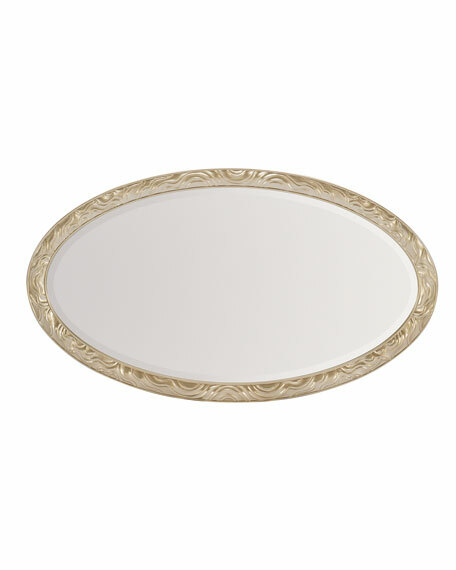 Venetian-style round mirror. 16"W x 0.5"D x 21.8"T.Mirror and wood composite. Imported.Weight, 6 lbs. Boxed weight, approximately 10.5 lbs. 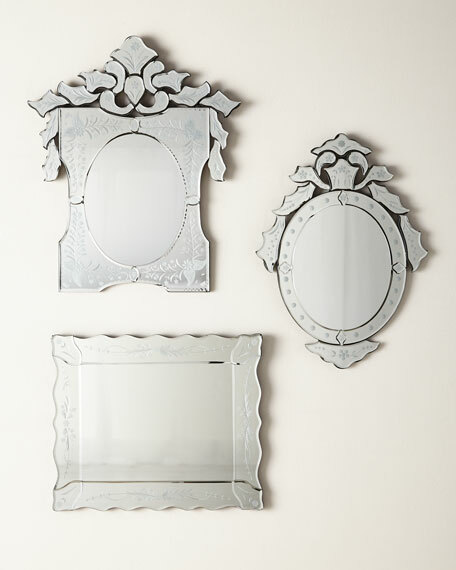 EXCLUSIVELY OURS.Beveled mirror.Polyurethane frame has hand-painted antiqued-silver finish.42"W x 2.75"D x 60.25"T.D-ring hangers included.Imported.Weight, 41 lbs. Boxed weight, approximately 55 lbs. 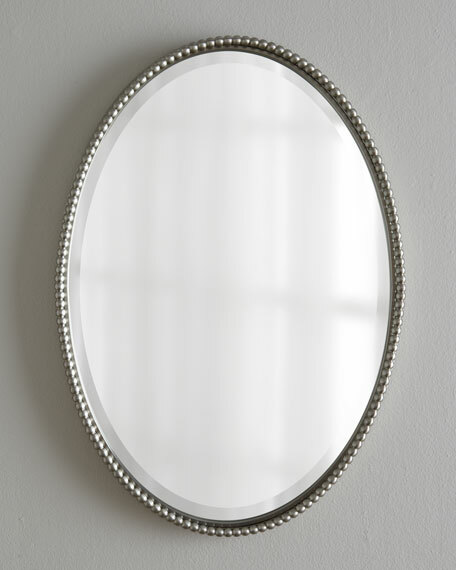 Beveled mirror.Beaded frame made of hand-forged metal.Brushed-nickel finish.Hangs vertically or horizontally.D-rings on back for hanging.22"W x 1.75"D x 32"T.Imported.Weight, 18 lbs. Boxed weight, approximately 20 lbs.